Hurrah! Russia 2018 FIFA World Cup Matches are now available on latest DLS 18 Mod Apk for Android devices for you to download and enjoy the beautiful memories of the biggest football even held in Russia recently. We give thanks and credit to game lovers who developed this version of the game and added many latest features to mimic the world cup 2018 tournament. So if you are searching the internet for the free download link for DLS 18 WC Apk + OBB + Data + Password, this post is for you. 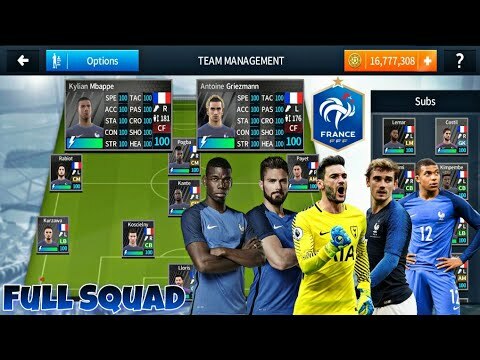 Dream League Soccer 2018 (DLS 18 WC) Fifa World Cup 2018 comes with all the updates from the World Cup Competitions as you will enjoy picking your favorite country from Brazil, France, Croatia, Argentina, Spain, Switzerland, Germany, Sweden, Nigeria, Denmark, Uruguay, England, Russia, Egypt, Senegal etc to compete and try to win the ultimate world cup trophy. DLS 18 FIFA World Cup 2018 also features all the top footballers that stared the tournament including Luka Modric, Kylian Mbappe, Harry Kane, Eden Hazard, C Ronaldo, Lionel Messi, Perisic, Varane, Kante, Neymar, Pogba etc. You will enjoy playing DLS World Cup 2018 Apk in your Android smartphone because the graphics is amazingly improved making the new players jersey (kits) look awesome in well constructed stadiums and pitches. 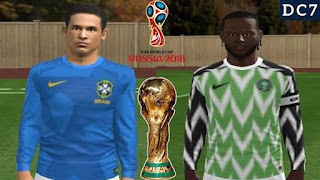 The Nigerian football team Jersey was rated the best in the tournament and it's clearly depicted here on DLS 18 World Cup Game. Other kits that looks amazing are France, Coratia, and the English team Jersey. The Dream League Soccer World Cup Russia 2018 Mod Apk works on all Android devices and supports versions from 4.0 and higher. You get to also enjoy Multiplayer mode, unlimited coins to be able to unlock some premium features like kits, stadiums, heal player health, transfers etc. 4. The football used in this game is similar to the history making FIFA 18 world cup ball that has the flag of all the participating nations enshrined on it. 10. Players can be unlocked with new card to get more out of their new ability. All links available in Google drive but if you want to download it from other sources like datafilehost, Dropbox, zippyshare etc, I can provide that for you. Interestingly, you can get DLS Nigeria World Cup Kit by clicking here, after that, Copy & Paste Url On Dls Mod WC and you are good to go. 2. Extract the File with the help of ZArchiver or any zip management app. You will see 2 Files & Dls WC Apk on your device after downloading and unzipping. Remember the password I provided earlier. 5. Now Install the APK Game and enjoy the game play when you launch it. Now you have successfully installed latest version of DLS mod for world cup 2018. Enjoy!